Rapidly becoming as well-known for its mini PCs as it is for its Nvidia-based graphics cards, Zotac has released yet another version of the ZBox. This time it's the diminutive ZBox ID80 Plus; the 'Plus' meaning that the unit comes with memory and a hard drive pre-installed. The ZBox is the bulky, bigger brother of the ZBox Nano. This ZBox employs a desktop version of Intel's latest Atom platform refreshes, codenamed Cedar Trail. The new CPU's have had a die shrink - 32nm down from 45nm - and uses an entirely new GPU core. The D2700 Atom CPU comes with a 2.13GHz clock speed and - whereas the previous processors only supported DDR3 up to 667MHz - Cedar Trail processor support, DDR3-800 and 1,066MHz. With a TDP of 10W the desktop part is also very power efficient; with the new mobile part even more so. The biggest change in the new Atom platform - apart from the die shrinkage - is in the design of the graphics. The previous generation of Atom CPUs used the GMA3150, which was based on the GMA3100 GPU, but in the new architecture the graphics are powered by a PowerVR SGX 545 from Imagination Technologies. Unfortunately, we can't gauge how much of an improvement - if any - the new sub-system offers, because it has been turned off in the ZBox ID80 in favour of the Nvidia GeForce GT520M GPU, which has been added directly to the motherboard. The price doesn't include an installed OS, but memory wise, Zotac has fitted 2GB of DDR3 1,066MHz, though the mobo can support up to 4GB, and the hard drive is a mechanical 5,400rpm 320GB spinner. The ID80 comes with plenty of USB 2.0 ports, which makes loading an OS a lot easier an operation than on Sapphire's HD3 - as long as you have an external optical drive or the OS stored on a USB stick or external hard drive. The Zotac certainly looks the part in its aluminium and super-shiny piano black finish. When it's switched on a large bright blue ring appears on the top. Thankfully this isn't connected to anything like the hard drive - if it were, it would surely drive you up the wall when it started flashing. Connection-wise, it's well catered for - not only do you get Wi-Fi and Gigabit Ethernet there's also a USB-driven IR receiver and a remote control bundled in the box. Fancy. The ID80 Plus not only comes with its own plastic stand, it also comes with a VESA mount, which enables you to mount it on the back of a monitor or TV, add a wireless keyboard and mouse and hey presto you have a space-saving PC, albeit a space-saving PC with some core performance limitations. 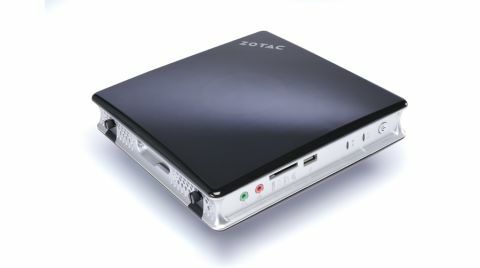 Apart from the lack of an OS there's not an awful lot to dislike about the Zotac ID80 Plus. Yes, the performance isn't great but then you could always opt for the standard ID80 barebones system and fit the maximum amount of memory and an SSD in yourself for that bit more get-up-and-go.